Some time ago, we read of the passing of an 82 year old woman named Lahoud. We remembered her as the operator of a large rooming house at the corner of Windsor Avenue and Chatham Street during the first war. 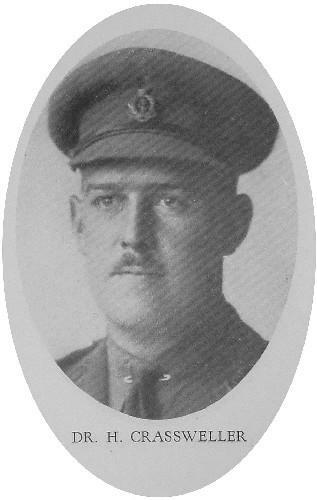 Among her roomers were Andy Galbraith, Jock Campbell Durwood, who were all with the First Division, and Jimmy McLelland [McLellan] who was with the Eighteenth. At that time, she was a tough old dame. She had to be to handle that crowd. Jimmy McLelland was born in Scotland and had only been in the United States for a few years when war was declared. He later came over to Windsor to enlist. Jimmy was in his mid-thirties and was articulate and witty. He was also fond of his Johnny Walker, and after we were nicely settled in London, he soon found out there was a guard room. When we arrived in England, he did much better as he was too tired to walk to Hythe after the strenuous training. Jimmy was wounded late in 1916. It was after the Somme. To hear Jimmy tell it, when he was hit on the arm, he thought he had a nice little blighty. It turned out to be more serious as he lost the partial use of his arm. After being hospitalized in England, Jimmy returned to Canada, was discharged, and came to live in Windsor. He was always at loggerheads with the local office of the D.S.C.R. [iii] as he always claimed he was not getting a pension consistent with his wounds. He argued with Col. Casgrain, Dr. Crassweller[iv], and a relieving Doctor from London. The latter suggested he should go to Westminster for a thorough examination. When he got there, they put in the Dardanelles and started giving him psychiatric treatment. Jimmy returned somewhat subdued. A few months later, he moved to Detroit and some of the fellows who met him there claimed he was working as a lookout for one of the bookies in Greektown. Jimmy later left Detroit, and several years later he returned to Windsor claiming he had been living in California. He also mentioned he had been in the movies. It appears that when they were making the picture “Calvacade” [sic] there was a mob scene at the station as the troop train was pulling out. Jimmy was one of the mob. The casting director[v] was a former British Officers who often went to the British Veterans Club in Los Angeles for extras and Jimmy was one of those selected. Several years later, Jimmy had a heart attack and passed away, the only mourners at his funeral service being some former members of the Battalion. Jimmy lived the kind of life he liked and never tried to change or alter it. It was a lonesome life as he never married. With all his failings, Jimmy was still a nice chap and absolutely honest. He was also quietly proud of his service with the 18th Battalion. This story brings to life the world of Private James “Jimmy” McLennan by fleshing out some of the details of his life after his service to his country. Coupled with an examination of his service records it reveals something about his experiences in the war and these experiences and injuries, both mental and physical, appear to be exacerbated by the post-war treatment of the very organization that was formed to help veterans like him. The story (author unknown) starts with a wonderful aside about a woman running a boarding house in Windsor populated by four veterans of The Great War. She was “…tough old dame…” and was able the likes of the hardened veterans of the war who survived trench warfare. We then get some background biographical details of Private McLennan’s post-war life. He emigrates to the United States and when the war starts come to Windsor to enlist. His service records show he enlisted November 3, 1914 with the 18th and was assigned the regimental number 53368. As stated in the story, he was 36-years old, an above average age for a recruit in the C.E.F at that time and distinguished in the description as being “articulate and witty”. He obviously had some run ins with the Provost Marshals at the training camp in London, Ontario as he “…soon found out there was a guard room,” eluding to him being put on a charge for drunkenness and being detained at the post’s guard room until his case was presented before a higher authority. Private McLennan’s service card during the period the Battalion was in Canada forming up and training (October 1914 – April 1915) is clear of any notations indicating he was charged with any offences except for a note for January 1915 where a sum of $3.20 appears to be withheld. There is a notation referencing a Daily Order No. 80 but, alas, no other detail is extant. It was common to fine soldiers’ money for lost equipment or for being absent without leave. The story offers that he like to drink his Johnny Walker and it interfered with his service and caused disciplinary problems. Upon the Battalion’s arrival to West Sandling in Kent this issue became moot as Private McLennan was not willing to walk the approximate 2 miles to Hythe to partake in alcohol at one of the pubs. Private McLennan is the wounded in the arm and was hoping it would be a “blighty” – a non-permanent wound that would get him out of service. The wound turns out to be more serious and he is treated and returned to Canada and discharged from service. Post-war Private McLennan’s wound persist in bothering him and he attempts to get help from the Department of Soldier’s Civil Re-establishment with his wounds. There is an interesting, though vague, part of the story of him being initially treated at a medical facility in London, Ontario (Westminster) but he then is transferred into psychiatric treatment at a facility referred to as the “Dardanelles”. It is not known if this is the actual name of the facility or a nickname alluding to the outcomes that occur to the veterans there as it refers to the disastrous Gallipoli Campaign that occurred in the Dardanelles from February 1915 to January 1916 which resulted in 302,000 casualties. He then moves back to the United States and it appears that he was working for a bookmaker in Greektown, a section of downtown Detroit. He then moves to California and has a part as an extra in the movie “Cavalcade”. It is not clear if he returns to Detroit or Windsor, but he dies of a heart attack and he is attended to at his funeral by some of his comrades of the 18th Battalion. The memory touches on another member of the 18th Battalion and gives us an idea of a man that is unsettled and is not able to gain stable employment. Though, according to his attestation papers, he was originally a sailor (ship steward)[vi], McLennan moves into the shadows of society working for a bookmaker. His role as a “lookout” clearly indicated the lack of legal acceptability of this type of enterprise. What is disturbing is the story alludes to an institutional neglect and, perhaps, even abuse as he is at “loggerheads” with the organization that purportedly exists to help him and he is sent from Windsor to London for treatment and is assigned to psychiatric treatment that leaves him “…somewhat subdued.” There may be no way to verify this part of the story, but details of the story are fleshed out with the names of prominent physicians in the Windsor area. Colonel Casgrain had a direct connection with the 18th Battalion as he served with it during its formation and later into its service in Belgium. Private McLennan’s overseas service record gives some indication of his behaviour. He is punished for being absent without leave while the Battalion is in England during September 1915. Later with a charge of refusing to obey orders in December 1915 and then in April 1916 he is absent without leave while the Battalion is in a rear area. At sometime in January 1916 Private McLennan is buried by a shell and this results in the dislocation of his right elbow. He is attended to by a medic and applies liniment as a course of treatment. He is assigned rest and light duty. The dislocation becomes sore and he reports sick on January 10, 1917 where his journey to England and further treatment begins. The medical records indicate that he fractured the ulna. On December 26, 1917 a Medical Board is convened reviewing the circumstances and medical status of Private McLennan’s wounds and determines that his wound is of a permanent nature and that it occurred in the line of duty and would it would degrade is ability to earn a living in the untrained labour market by 30 percent. This is the last of several medical board reviews. This is atypical of a soldier’s discharge. In most cases a medical board in convened in England determining the medical condition that exists for the soldier requires discharge and then a final medical board upon discharge his held. It often confirms the first board’s findings and decides as to the extent of compensation the soldier is eligible for. Private McLellan seems to have been examined several times to set the appropriate rate of disability. The records do not indicate if this activity was initiated by him or the military authorities and there are some inconstancies between the Board’s reports but, overall, they are consistent with each other. Why the change? All the administrative documentation for this soldier’s discharge was clearly supporting a medical discharged base on a wound that occurred due to service. Yet, the last document created indicates a totally different reason for discharge. Shell shock held a negative connotation in the culture of the time and the public and medical understanding of what caused, comprised, and resulted in the suffering of “shell shock” was not well understood and was generally assumed to be for reasons that were lacking within the mental make up of the soldier. The service records give no indication of any treatment or correspondence after McLennan’s discharge leaving his post-war experience a mystery, save for what the “Memory” tells us. The “Memory” fleshes out the post-war experiences of a soldier of the 18th Battalion. It appears to be based on some hearsay and supposition. It alludes to a possible institutional abuse as Private McLennan tries to get help with his issues regarding compensation for his wound to his arm. Is it possible that the bureaucratic change made at discharge where the medical board recognized his physical disability from his wounds was changed to “shell shock” to deny him compensation for his physical wounds? During his attempts to resolve this issue a doctor suggest he go to London “…for a thorough examination,” and is directed to psychiatric care. McLennan returns from this experience “…somewhat subdued,” and no further description of this condition is offered. Is he demoralized by a system that let him down? Did he suffer some aspect of drug or mental medical treatment that left him in this way? The story is not able, or willing, to give any more detail. Private McLennan appears then to drift, moving to Detroit and getting involved in the shady side of society acting as a lookout for a bookie. He obtains, apparently, lasting immortality as he is an extra in a Hollywood movie by the chance meeting of a casting director for the production. As no photograph of “Jimmy” has yet to be discovered we will not be able to recognize this man who gave his physical and mental well-being to his Empire and comrades. In the end the community of the Battalion is able to maintain a connection with the “articulate and witty” Jimmy McLennan who liked his Johnny Walker. He dies, effectively alone, but his comrades-in-arms are there to attend his funeral, remember him, and make sure he is honoured and not alone. They never gave up on Jimmy. Colonel Henry Raymond Casgrain was a physician and surgeon from Windsor, Ontario. He was an original member of the 18th Battalion and joined the C.E.F. at the age of 57-years old. It appears that the documents were written in the early 1970s, a full 50-years after the end of The Great War and are a valuable social history of soldiers’ experiences as told in their own words about the events that happened a half-century ago to them, and now a full century for us. [ii] The transcription and research of these “memories” is an attempt to connect and identify the people mentioned in the stories with some accuracy. This is, in no way, a definitive identification of the people in the stories but there is high confidence that these are the men mentioned in the “memories”. In some cases, the story may identify people, places, dates, times, and details inaccurately and, where possible, these details are noted. Given that the men relating these memories would be in there late 70s, at the minimum, their errors can be forgiven. The stories related stand on their own as a social history of the experiences of the men of the 18th Battalion. [iii] Department of Soldiers’ Civil Re-establishment. [iv] Dr. Henry Crassweller was a physician and coroner from Windsor, Ontario. There is no information at the Library and Archives World War 1 Soldiers site available for this person. [v] Possibly Jack Gains. No biographic information is given at this site. [vi] Per his Canadian Overseas Expeditionary Forces Discharge Certificate dated January 14, 1918.